This is a simple exercise to practice the parts of the body in English. 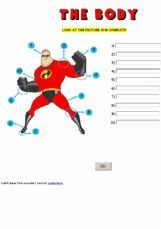 Students must write the correct part of the body in the boxes according to the numbers shown in the picture. Body basic vocabulary: head, body, arms, hands, legs, feet. 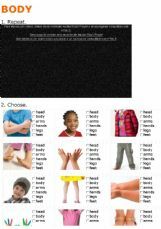 SPELLING PARTS OF THE BODY, SONG HEAD SHOULDERS KNEES AND TOES. Two exercises about the famous song. BODY PARTS: 1. Tick the correct answer 2. 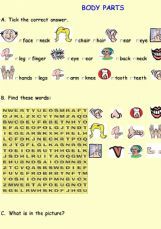 Find the words 3. What is in the picture? An Eric Carle book about animals, bodyparts and action verbs, with exercises. 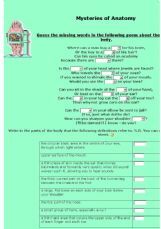 An online reading comprehension for the reading comprehension worksheet about body descriptions. 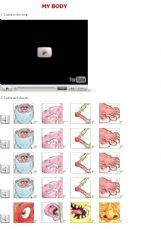 Children watch the video, then do the exercise.